"Find most cost effective way to promote brand"
Brand Promotion is necessary for any company as it helps in establishing relevance, grab eyeballs, raise awareness, build relationships at a personal level, create memories, increase loyalty, encourage interactions and stimulate positive WOM (word of mouth), said Prateek N. Kumar, Managing Director & Chief Executive Officer of NeoNiche Integrated Solutions Pvt. Ltd. In an exclusive interview to SME Times, Kumar said, "Small and Medium Enterprises (SMEs) just need to find the most cost effective way to promote their brand. Branding is a long drawn process which requires meticulous planning," he said. Please tell us something about NeoNiche integrated solutions? Prateek N. Kumar: NeoNiche Integrated is an experiential marketing company which acts as a marketing extension to the clients that we serve. We conceptualize multi-disciplinary brand building strategies across different platforms be it online - digital and social, or on ground through customer contact programs, events and exhibitions. At the core of our offering lies our value proposition of Ideas, Innovation & Insight. How and why brand promotion is necessary for any company? Prateek N. Kumar: In this era of globalization and technology a prospective customer is bombarded with multiple choices where brands are vying for a piece of his/her mindshare, For a Company or a Brand to be sustainable and to create "Top of The Mind" recall it is not only necessary to have "Brand Promotion" at the heart of its "Marketing Mix" but it is also paramount it helps in establishing relevance, grab eyeballs, raise awareness, build relationships at a personal level, create memories, increase loyalty, encourage interactions and stimulate positive WOM. Small businesses usually suffer from lack of funds. What strategy should they follow in this situation? Prateek N. Kumar: Today the SME segment is a potent force to reckon with but usually Small businesses do suffer from lack of funds that a large enterprise enjoys; large enterprise spend a lot in developing their brand identity. Does that mean creating brand name is expensive? Not at all, you just need to find the most cost effective way to promote your brand. First do a little research work and decide what will be the best medium to reach your target audience. Think of some unique ways to communicate with your target audience. You do not need to cross the limits of your existing budget in order to create a sellable brand. Try innovative approach like Profit sharing rather than cost based model with "Agencies", or Utilize online tools. Etc. SMEs do not take branding too seriously, or they cannot afford it, or they don't find it worthy -- what do you think? Prateek N. Kumar: A SME usually does not have the kind of resources and budgets that a large enterprise has. Moreover, Small businesses try to create sustainability for themselves by focusing on gaining more business and market share, As such they do not have the luxury for the rigors of "Marketing Mix". To be fair SME's require right kind of Agencies who can partner with them to bring their "Brand" alive in experiential space like an extended marketing team. What mistakes SMEs usually make when they go for branding? 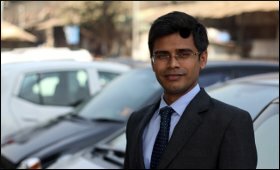 Prateek N. Kumar: Usually lot of SME's take their marketing initiatives as an afterthought, while Branding is a long drawn process which requires meticulous planning and be it identifying the TG (Task Group), understanding the "differentiation" that an SME wants to create and the medium that needs to be used are the important aspect that needs to be taken with a long term view. Today's market is crowded with competition, with thousands of businesses selling similar products almost in every segment. How everyone can be different from everyone? What factors a business should consider while creating its own unique branding strategy? Prateek N. Kumar: You need to focus on establishing relevance, grab eyeballs, raise awareness, build relationships at a personal level, create memories, increase loyalty, encourage interactions and stimulate positive WOM. Stand by what you promise to make your Brand the cynosure for your TG. What makes the difference now is delivery, not promises -- it's not what a brand says, but what it does. How branding can be used effectively with other elements of marketing, such as product and pricing? Prateek N. Kumar: Consumers want compelling demonstrations and credible recommendations -- and with today's rapidly proliferating social networks and specialist blogs, they have no trouble finding them. To get onto consumers' radars, a brand needs striking products that get people talking at a price which is affordable. This means enormous opportunity for the Companies that recognize that the savviest consumers pay more attention to the tangibles products & Services than to the intangibles brands promise. Smart companies understand this and marries the two to create an experience. You are in SME sector. What are the issues that you think should be addressed by the government for betterment of the sector? Prateek N. Kumar: There are lot of steps that are already taken for the betterment of SME sector, be it setting of Special Economic Zone (SEZ), MSMED Act, etc. There is a dedicated ministry in terms of Ministry of Micro, Small & Medium Enterprises. However, funding and financing is something where we can see a lot happening in future. You are in online business. What steps do you think the government should take to promote e-commerce in India? Prateek N. Kumar: We have a large segment of "micro-entrepreneurs", manufacturers and producers who exist in villages and tier 3 cities. If we are able to move from e-tailers model to e-marketplace model we would be creating whole new opportunities not only for consumers globally but would also be creating a supportive ecosystem for such "micro-entrepreneurs".